Distributors are weather proof and dust-tight. For electric models the accuracy of the spout position over the pre-selected outlet is assured with positive acting limit switches, preset and pre-wired at the factory. All distributors are test run at the factory prior to shipment. Electric models are furnished standard with TEFC brake motors and dust-tight limit switch enclosures. For environments where potential explosion hazards exist, the motors and brakes can be furnished with Class II Group G ratings and with UL rated limit switch enclosures. Hayes & Stolz standard control panels for electric rotary or swing distributors consist of a NEMA 4 enclosure with a rotary selector switch for outlet/bin selection, a push-button for energizing the drive motor and indicator lights to indicate the distributor spout position. For distributors with more that (16) outlets, two selector switches are included. For abrasive applications, all models of Hayes & Stolz Distributors can be furnished with abrasion resistant liners at impact points and on the sloped portions of the internal spout(s) and outlets. Standard lining materials are 1/4” polyurethane, 3/8” ceramic-chip-embedded polyurethane or 1/4″ ceramic hex tiles. 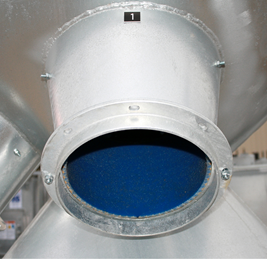 For lined rotary distributors, the internal spout is split and bolted for access to the liner material. Wear areas can also be manufactured of A/R (abrasion resistant) steel for prolonged wear life. All Hayes & Stolz Distributors can be furnished of mild steel, stainless steel or galvanized construction. Mild steel units, manufactured entirely of mild steel, will have the interior and drive chamber primed with a rust-inhibitive primer and the complete exterior painted with an industrial polyurethane topcoat (standard color is SW Pillar White) over rust inhibitive primer. Stainless steel units are standard with stainless steel bodies and internal product contact surfaces, with mild steel construction inside the drive chamber which is isolated from the product contact zone. The mild steel in the drive chamber is primed with rust-inhibitive primer. The stainless steel exterior can be unpainted or painted with an industrial polyurethane topcoat (standard color is SW Pillar White) over stainless-compatible primer. 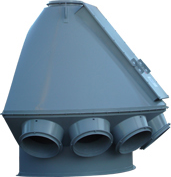 Models E, C and E4N can be furnished in a “flat-back” design for close mounting to the bucket elevator or structure. With modern facilities getting larger and with production capacities increasing, the size of equipment for these facilities also increases. Sometimes the size of a distributor prohibits transporting it fully assembled. And sometimes facility obstacles prohibit installing a fully assembled distributor. When transportation or installation will not permit fully assembled distributors, Hayes & Stolz can design and manufacture the equipment split and match-marked for field-bolting at installation. Hayes & Stolz is not just an equipment manufacturer. We Deliver Solutions. Contact a qualified Hayes & Stolz Sales Engineer to discuss custom designs of Hayes & Stolz Distributors to meet your specific needs.